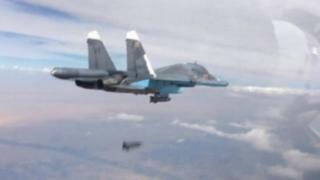 Russia is increasing the number of air strikes against Islamic State in Syria, its defence ministry has said. It said on Saturday morning that it had hit 55 Islamic State (IS) group targets in Syria in the last 24 hours. Later, US defence officials said progress had been made during talks with their Russian counterparts on avoiding accidents over Syria. Syrian rebels and Western governments say Russia has mainly been hitting non-IS targets. The US has accused Russia of running a "fundamentally flawed" campaign in Syria that risks further escalating the conflict there. The Russian military on Saturday said that the most recent air strikes - carried out in the provinces of Damascus, Aleppo, Hama, Raqqa and Idlib - destroyed 29 "terrorist" training camps as well as 23 defensive positions, two command centres and an ammunition depot. To explain the intensified strikes it cited "a significant increase in the number of ground targets" located by air-based and space-based reconnaissance teams across Syria. While Raqqa in eastern Syria is an IS stronghold, the militants are not known to be strong in the other provinces. "In the initial stage of our operation, our aircraft destroyed the principal and largest logistical hubs of the IS terrorist group," a defence ministry statement said. "This has led to a significant reduction in the fighting potential of armed groups, and a reduction in their mobility and their capacity to launch offensives." The BBC's Jim Muir in Beirut says Russian air strikes seem to be mostly hitting Syrian opposition forces that pose more of a threat to the Syrian government. Russia maintains that rebel fighters are running short of arms, ammunition and fuel, leading many rebels to abandon their combat positions and head for the country's east and north-east. There have been concerns that there could be an accidental clash as the two countries pursue separate bombing campaigns over Syria. The US and its Nato allies have expressed alarm at violations of Turkish air space by Russian jets last weekend. On Saturday officials at the US Department of Defense said they had held a conference call of around 90 minutes on air safety during Syria bombing campaigns. "The discussions were professional and focused narrowly on the implementation of specific safety procedures," a spokeswoman said, adding that another discussion would take place in the near future.